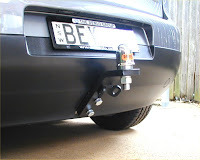 As the VW Golf has exploded in popularity this has become one of our top selling tow bars. The Hayman Reese tow bar we use is rated to 1250kg max trailer and 120kg max down load. 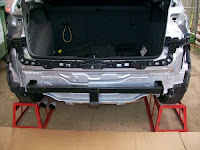 The bar is pretty straight forward as it simply slides down the chassis rails and secures with a couple of bolts each side through the rail walls. The trickiest bit is the bumper cut which takes a lot of care to get a neat symmetrical outline. 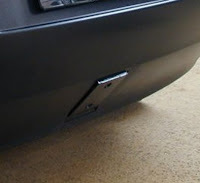 The trailer lighting plug on this vehicle requires an electronic control box to be fitted to prevent damage to the car's electronics and the trigger sources have to be carefully selected because the Golf has a multiplex wiring system. The multiplex system results in the tail lights and brake lights sharing the same wiring. NOTE 2011: Hayman Reese have now developed a vehicle specific wiring loom that is able to interpret the multiplex tail/brake signal using an ECU control box which makes this a very neat electrical fitment. We have fitted the bar to the new Golf VI and it fits fine. 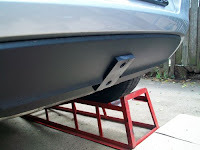 The photo below shows the difference in how the bar fits with the bumper, with the lug removed. On the Gti Golf the tow bar doesn't line up as nice with the bumper as the models shown above. It looks ok with the tongue fitted and we used a bit of trim to tidy it up but it can look a little bit messy with the tongue removed.